King of the Nerds 2x05 "Trek Wars"
Sigh. No sooner had I decided a certain contestant was one of my favorites, than that contestant was sent packing! Curses! Anyhow, this week's episode featured a theme that we also saw last season - debate! Whereas last season the debate was about superheroes, this season featured one of the greatest nerd debates of all time. If you don't already know what that is, then perhaps you're not a Nerd. That's right, I'm talking about Star Wars versus Star Trek. It's all fun and games until you start shooting plasma beams. Midas Touch Attack got to pick which side they wanted to fight for first, and they chose Star Wars. You'd think maybe it might have been better for them to pick Star Trek since they know Kayla is a huge Trek fan, but in the end they picked the one they thought they could fight better for. What they didn't expect was to find that Jack has not seen either of the two franchises, and does not even know what the Millennium Falcon or Enterprise are. Egads! On the other team, Xander decided to sit this one out while Kayla, Brian and Chris fought for Trek. When it came time to debate, the most exciting judge this time around was Billy Dee Williams, everyone's favorite Lando Calrissian. Another judge was the head of debate at USC and Kumail Nanjiani. And then it was time to debate! Kayla and Katie started it off with a debate on whether the Enterprise or Millenium Falcon would win in a dogfight. Despite my actual belief that probably the Falcon wouldn't stand much of a chance against the Enterprise, surprisingly Katie won with her points that it could get in and out quickly since it was much smaller. Point one to team yellow. Up next was Chris versus Zack. Their question of contention was whether the Empire or the Borg were more dangerous as evil entities. Here, Chris' debate training really helped him out, and he took that one home for the Titans of Rigel. So, for those keeping track, that's 1 point for each time. Down to the final debate, Brian versus Jack, and whether the Wars or Trek universe was generally better. Jack, knowing not much of anything about the series, decided to go from a purely statistical standpoint, comparing the monetary value and general public feeling for each series, with Star Wars coming out on top. But Brian came at it differently, arguing more on the basis of story and what the purpose of each series is, and won for his efforts. So, that's a continued win streak for team purple. Farewell Katie and her awesome purple hair! So, Midas Touch Attack was in for yet another Nerd Off. Zack and Jack basically told Katie that, despite her being the only one on their team to win a point in the debate, they would be voting her in to the Nerd Off because she was really still on the Titans of Rigel's side. I mean, look at her hair. The titans did try to sway Jack to instead vote Zack, arguing that they would be more on his side if he did, as they would be voting him in either way. In the end, their efforts were for naught, as Jack voted for Katie to go in. Thus, it was Katie and Jack in the Nerd Off. A Nerd Off of spelling! Now, this is one based more purely on skill than any of the others we've had so far. Or, at least, memorization ability. While Zack helped Jack to memorize a bunch of science fiction and fantasy words about stuff he had basically no knowledge of, the others all helped Katie, who apparently is not the best speller. Sadly, I think we could see where this was going. 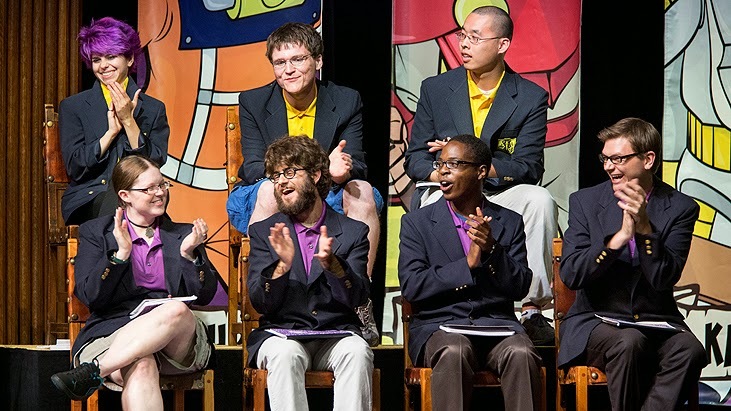 In the Nerd Off, each player also had to pick someone who would get shocked any time they spelled something wrong, so there was a double whammy of pressure for them to get things right. Things were close, so close that it came down to one final point. A point that involved spelling a word that Zack had been drilling in to Jack a bunch of times, which my boyfriend pointed out seemed a bit fishy, as the producers were likely able to see that too and could therefore weight the questions in Jack's favor. Do we believe in such trickery? Hmm. So, yes, Katie ended up losing, which is a shame because she was definitely one of the people who seemed the most like she was having a genuinely good time, and actually cared about the other people there. It was interesting to note it seemed like she only hugged her other purple team members and not Jack or Zack, but then they did kind of stab her in the back. All I know is, if Zack wins this whole thing, it will only make him worse. They dialed back some of his shenanigans this week, but he was still sniggering in the background through the whole Nerd Off any time something went in Jack's favor. Well, that's it for this week! Kayla is now the only girl left in this competition! Eeesh! Vote below for who you'd like to see take it all.